It has been eight years since the January 25, 2007 Revolution, which led to the overthrow of Hosni Mubarak, who ruled Egypt for 30 years. Eight years have passed since the January 25th Revolution, which resulted in the overthrow of Hosni Mubarak, who ruled Egypt for 30 years, but the process has changed and the role of the defendants as witnesses has changed. The deposed President Mubarak and his ministers, bureaucrats, deputies and dozens of senior officials; he was detained and prosecuted on charges of deliberate killing of activists, incitement to murder, indicted bribery and corruption. However, during the intervening 8 years, almost all of the Mubarak figures were acquitted or counted days to be released. Eight years have passed since the January 25th Revolution, which resulted in the overthrow of Hosni Mubarak, who ruled Egypt for 30 years, but the process has changed and the role of the defendants as witnesses has changed. The deposed President Mubarak and his ministers, bureaucrats, deputies and dozens of senior officials; he was detained and prosecuted on charges of deliberate killing of activists, incitement to murder, indicted bribery and corruption. 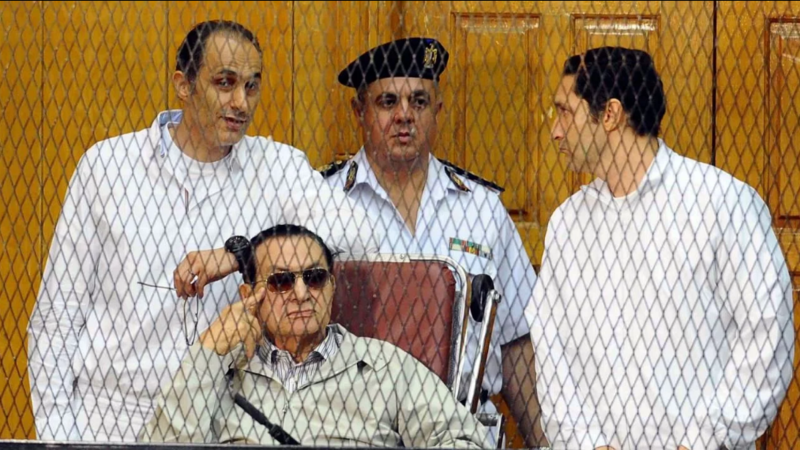 However, over the last 8 years, almost all of the Mubarak figures have been acquitted or counted days for release. Mubarak and his comrades are no longer the defendants, as is the case in the sand Prison Raid de case, which was seen about a month ago. In 2011, when he appeared before the judge for the first time, he was brought to the courtroom on a stretcher at the age of 83. On 26 December 2018, Mubarak's witness seat was recorded as the day when Mubarak and Egypt's first democratically elected President Mohammed Morsi confronted him. The deposed President Mubarak was in the seat of the defendant, Egypt's democratically elected first President Morsi, and 27 others were in the glass-reinforced glass cage. Morsi was standing against the other defendants. His situation was interpreted as an excitement in the public opinion of the country. The cameras viewed Mursi in a corner while following the ones in the hall. During the trial, the martyr Esma’s father, Mohammed al-Biltaci, who was found inside the glass cage, was given permission to ask the judge to ask Mubarak. Biltaci's questions about Mubarak were about 800 people who were allegedly entering Egypt's eastern border during the events of the 25 January Revolution, firing at the activists and claiming chaos in the country. However, the overthrowed President passed the questions with evasive answers. Biltaci said that at the end of his speech, Mubarak was lying and could not escape divine justice. Habib al-Adli, who made the Ministry of Interior during the revolution and was tried after the revolution, is now sitting on the witness stand, not the defendant. Mursi and 27 other people in the trial of "Prison Raid", he also participated as a witness. Forensic, during the trial of 25 January is not a revolution, Egypt is a "conspiracy" established by foreigners, he said. During the period of Mubarak 13 years, the Ministry of Internal Affairs of the Forensic, known as the anger friday and two days after the start of the actions on January 28, 2011 in the people's uprising, hundreds of young people were killed and thousands were injured. The judiciary's e killing demonstrators hep, ancak misconduct ancak and ”corruption e cases have been filed but they have been acquitted. According to the report of the Commission on Revealing the facts set up in the Egyptian parliament, 846 people were killed in the events of the January 25th Revolution.